Hey everypeoples, and welcome back to the Tachikaze Retrospective. Last time, we looked at the rather slow start the clan had, taking 3 full sets to become a fully-fledged deck. We also looked at how it was extremely budget, with only 1 inexpensive RRR to its name, and its only RR being a Perfect Guard. It would take almost a full year before we would see the cyborg dinosaurs again, and they came back with a few new tricks up their sleeves, but still have the same “Eat or be eaten” mentality. Booster Set 8, Blue Storm Armada, was a big set in more ways than one. It introduced Aqua Force to the game, provided new strategies to old clans like Neo Nectar and Dimension Police, and arguably started Narukami on the path that it would end up having in this day and age. If I may go on a brief tangent, it was also a big set for me as I have 3 decks built thanks to some of the cards in this set, not to mention having incredible luck with SPs (3 out of 4 boxes). Enough about me. 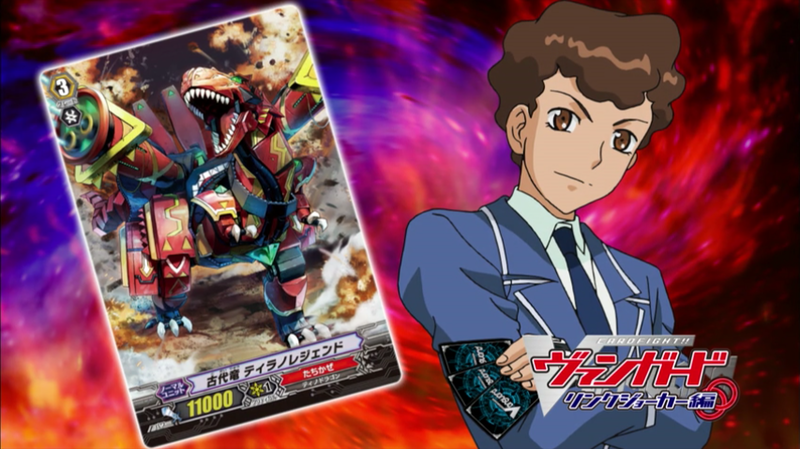 Tachikaze would once again be denied a RRR card, instead getting 2 RR cards: Military Dragon, Raptor Colonel and Destruction Dragon, Dark Rex. The former is the end result of the Military Dragon ride chain, which I’ll come back to. Dark Rex, however, offered a new way for the clan to Superior Ride, as well as make opponent’s think twice about Perfect Guards. Dark Rex was able to Bind itself from your hand to give one of your Tachikaze units a brief +3000 Power, but as long as he was in the Bind Zone, he was a nuke just waiting to happen. If your Grade 3 or higher Tachikaze Vanguard failed to hit your opponent’s unit (Vanguard or Rearguard), his Limit Break would Ride him straight from the Bind Zone after eating 3 Tachikaze Rearguards. Per the rules, Riding always happens in a Stand position unless Megacolony is involved, so this gave you another Twin Drive to gather more resources, in addition to any Dragon Eggs or Skypteros you may have retired in the process. This was huge as Standing a Vanguard in the Battle Phase usually cost them Twin Drive, but Tachikaze continues to be rebels in that regard. Speaking of Skyptero, we would receive new pterosaurs in the form of Beamptero and Slashptero, units that can give a Tachikaze a brief +3000 Power if they were retired during your Battle Phase. Using them in conjunction with Dark Rex would allow for an easy 16000 swing. Gotta love those magic numbers. On the opposite end of the coin, we also got Assault Dragon, Pachycephalos, a Grade 2 that would get a free +3000 Power when he attacks, should a Tachikaze be eaten during the Battle Phase. This, once again, works well with Dark Rex, and even Deathrex if played properly. We also got some more Savage units, War Chief, Warlock, and Magus. War Chief was your bar-standard “Extra 2000 Power when Boosted by clan” unit, while the other two were your self-damagers. Fortress Ammonite also came in giving Tachikaze their own Aermo clone. We also got a set of units that cycled through each other upon being eaten: Citadel Dragon, Brachiocastle, Carrier Dragon, Brachiocarrier, and Transport Dragon, Brachioporter. A mere Counterblast was all that was needed, and you were able to go through the cycle of Citadel → Carrier → Transport → Citadel, etc. Only downside is they were on the low-end of Power for their Grades (9000 for 3, 7000 for 2, 5000 for 1 respectively). Baby Ptero was a new First Vanguard, being the usual Grade 3 searcher. Finally, we also got a new rainbow of Triggers, this time none of them having effects, but the Draw Trigger in particular added Insect to the list of Races that Tachikaze had. As promised, the Military Dragon ride chain was the standard ride chain for the time: Ride the Grade 1, look for the Grade 2 or 3 from the top 7 of your deck. Otherwise, Forerunner the Grade 0. The Grade 1, Raptor Sergeant, allowed you to call another copy of it from the deck if you were able to Ride the Grade 2, Raptor Captain. This also held true when you would Ride Raptor Colonel on Raptor Captain. Raptor Colonel, however, had his own explosive Limit Break. A Counterblast and eating 2 Tachikaze units allowed him to add the combined Power of the eaten units to his own. Being a 19000 swing at most before this, it would occasionally require a handful of Guardians to block it if your opponent didn’t have any Perfect Guards. It wasn’t uncommon for Colonel to hit upwards of 30000 when he attacked, something we usually wouldn’t see until Legions were introduced. Noticing a pattern here? e lineup, however. Up until this point, Archetypes were slowly being introduced to the game. Musketeers, Dimensional Robos, Liberators, Jewel Knights, Eradictors, and Beast Deities were everywhere. It wouldn’t be until Booster Set 11, Seal Dragons Unleashed, came out that Tachikaze would find their own. Don’t let the name fool you. Seal Dragons weren’t the only things unleashed; the Ancient Dragons were as well. Starting off with the RRs, since Tachikaze and RRR go together like butter and a hot summer day, we got Ancient Dragon, Spinodriver, the Break Ride for the clan, offering 10000 Power, an extra Critical, and two drawn cards, all by eating 2 Rearguards. By replacing your resources like that, he was welcome with open arms, as was the main boss Ancient Dragon at the time, Tyrannolegend. By Counterblasting 2 Ancient Dragons, he would get a free +5000 Power, but his Limit Break let him eat 3 Ancient Dragons to get another free +10000 Power/+1 Critical, making him scary for those without Perfect Guards. We also got a new Perfect Guard in Ancient Dragon, Paraswall. There was also Ravenous Dragon, Battlerex…but we don’t talk about him. Other Ancient Dragon include Criollofall (Grade 2 10000 Power), Triplasma and Beamankylo (Grade 1 and 2 +3000 Power if Vanguard is Ancient Dragon), and Stegobuster (Grade 3 Counterblast 1 for +3000 Power). Clones aside, we also got Gattlingaro and Dinocrowd, two units that could eat an Ancient Dragon to get a free +5000 Power when they attack. Iguanogorg was a Grade 1 that could return himself from after being eaten for a Counterblast if your Vanguard was an Ancient Dragon. Babyrex would be the First Vanguard for the Archetype, being able to Call Tyrannolegend from the deck when eaten. We also got a rainbow of Ancient Dragon Triggers, with the Critical Trigger being your standard “throw into Soul to Countercharge”. Of course, it wouldn’t be Tachikaze without new Savages. Savage Hunter is…well, remember how I said Deathrex was the precursor for the generic Limit Breaks? Yeah, we’ve come full circle now. Savage Archer and Illuminator were your standard “Free +3000 Power if your Vanguard has Limit Break”. Savage Patriarch was a new First Vanguard, but it was the standard “Boost a Limit Break, throw into Soul to draw 1”. Finally, we got the random Launcher Mammoth, the standard “hit to Countercharge” that, honestly, Vacuum Mammoth should have been back in the day. That’s not the last of the Ancient Dragons, however. We got two new ones later on. One as a Promo, the other in Fighter’s Collection 2014. The latter was Volcatops, a Grade 3 that could power up your Rearguards with his Limit Break. I’d point out the fact that he was a RRR, but everything was RRR in FC2014, so he’s not that special. The Promo was Geoconda, a unit we wouldn’t see in the TCG for a long while. He was your standard Grade 1 “Soulblast 2 to Countercharge 2” unit commonly seen at the time, something that Tachikaze in general desperately needed. Normally, I’d save the Legion era for its own part, but Tachikaze’s run in Legion era is small, so I’ll throw it in here. Booster Set 17, Blazing Perdition, gave us nothing but Ancient Dragons. Say it with me now: “No RRR for Tachikaze this set”. To list off the standard clones: Rockwall is a Quintet, Tyrannoblaze is a Limit Break enabler, Crestrunner is a Legion Booster, Twin Axe Warrior is a Legion attacker, and Babysaurus is a First Vanguard that Calls a Legion/Mate from deck when eaten. We also got a new Critical and Stand Trigger, the Stand being a clone of Iguanogorg. That about wraps up this part of the retrospective. Both the Limit Break and Legion eras were nice enough to make Tachikaze feel important, if briefly, but they did get some cards that are still used in most builds today. Next time, we’ll see what the Stride era had in store for Tachikaze.